Atrium has once again proven itself as a true innovator by fulfilling previously unmet clinical needs in a way that benefits both the clinician and patient. By including pre-packaged sterile water to fill the water seal along with unsurpassed knock-over protection, the Oasis™ dry suction chest drain offers the ultimate in fast set-up and patient safety. 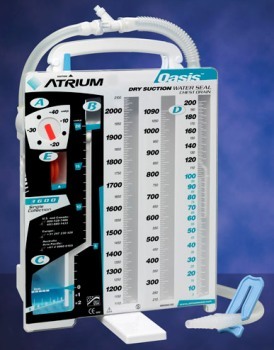 The next generation Oasis chest drain with its easy to use handle, combines the ultimate in adjustable vacuum control with its state-of-the-art dry suction regulator with a fully calibrated water seal. Other features include break resistant multi-position hangers, latex-free tubing, and Atrium's exclusive 24 hour technical support... because answering emergency technical questions is a 24/7 job here at Atrium.